The laptop marketplace is overflowing with 15-inch computers—a form factor that has taken the world by storm. 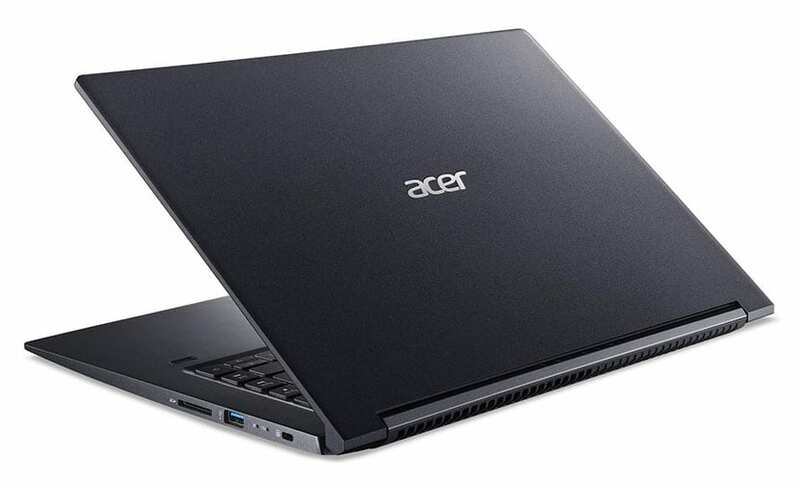 More and more computer manufacturers are coming up with portable, high-performing machines, and the Acer Aspire 7 A715-73G-75BW is Acer’s commendable addition to the list. 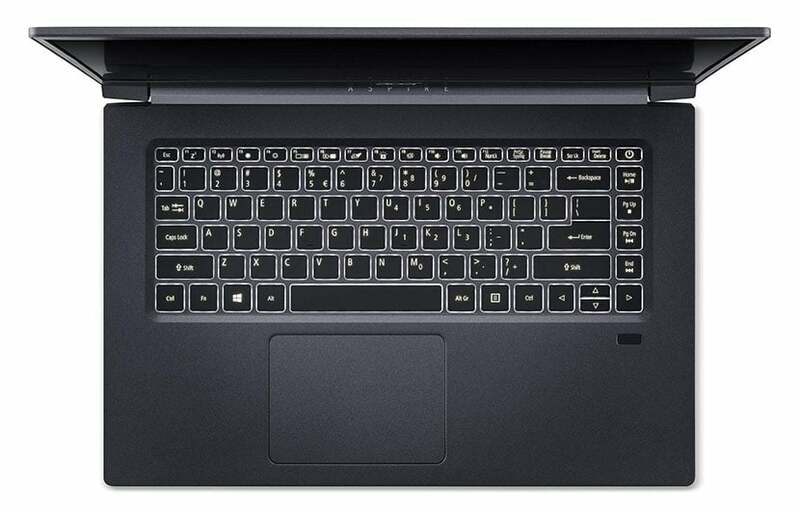 This 15.6” laptop achieves a rare combination of pleasant AMD Radeon graphics, speedy processing—thanks to its Intel Core i7 processor—and a portable body that weighs only 3.31lbs. 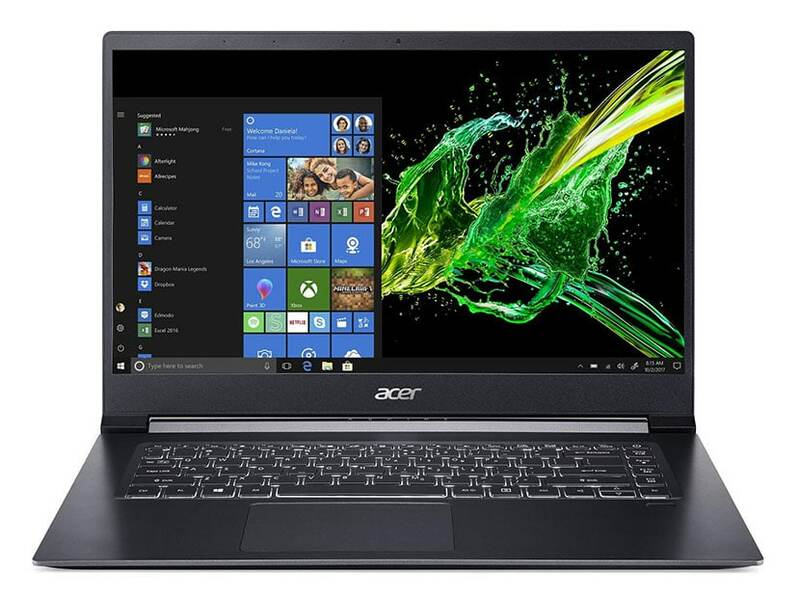 Priced under $1500, this Acer Aspire 7 is positioned at business professionals, creative souls, travelers, and students who require a lightweight but powerful machine to fuel both day-to-day endeavors as well as intensive pursuits like multimedia editing. In this comprehensive review, we find out just how successful Acer’s latest brainchild is at living up to its promises. 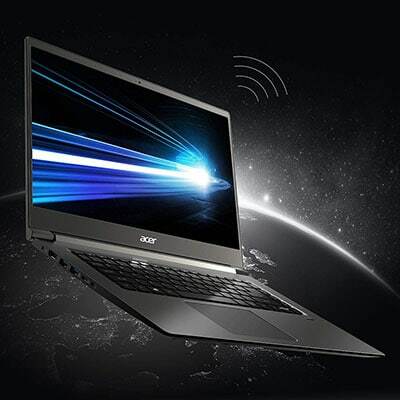 This laptop is fueled by an Intel Core i7 processor (eighth-gen) that can run up to 4.1GHz. Supporting it is a RAM of 16GB (DDR4), a storage space of 512GB (high-speed SSD), and a Windows 10 Home operating system. Goes without saying, these specs are perfectly capable of driving your laptop to excellence; you will experience fantastic speeds and efficiencies even when you are streaming wireless content or operating CPU-draining design software. Plus, the booting and loading times are also considerably lower; you can see a palpable difference when you work on heavy files. How about the battery backup? Well, the Lithium-Ion Battery (3220mAh, 4-cell) lasts up to seven hours on a single charge. While this is not phenomenal, it should be ample to see you through a significant part of your standard day. This 15.6” laptop sports a pleasing, vivid FHD display with an optimal screen resolution of 1920 x 1080. The thin-bezel design (0.24”) makes your viewing experience immersive, bringing down external disturbance to a bare minimum. It also increases your working area, realizing a screen-to-body ratio of 80%. Given the portable build of this device, it is a blessing that Acer hasn’t compromised on the screen real estate or finesse. The widescreen has an IPS panel (In-Plane Switching) to prevent the imagery from getting distorted with a change in viewing angle. Note that the graphics support is for AMD Radeon RX Vega M GL, with 4GB of high-bandwidth memory (HBM2, second generation). This, in addition to the 72% NTSC color gamut, brings alive the colors and details in your content. If you haven’t tried using AMD Radeon graphics, prepare to see an upswing from the integrated Intel HD Graphics commonly found in many contemporaries. 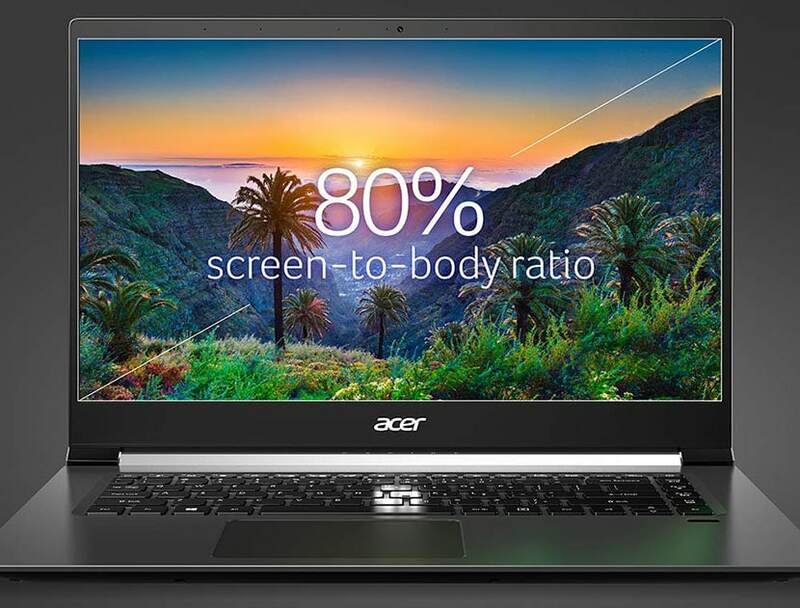 It is worth mentioning the role of the Acer Color Intelligence technology here—it adds an absorbing dash of realism and meticulousness to all your multimedia content. In the looks department, this Acer laptop is quite a style icon. It has an all-metal chassis that is both lightweight and attractive. Acer has utilized premium-quality magnesium alloys for the construction that are lighter than aluminum but, surprisingly, stronger. Thanks to this smart construction decision, the laptop weighs only 3.31lbs and measures 0.67” in thickness. The overall dimensions are 9.53 x 14.17 x 0.67 inches. These numbers become particularly remarkable in the 15-inch biosphere, where keeping the bulk down while adding features can be a weary challenge. If you need to carry your laptop along to meetings, classes, and flights, you can rest assured the weight won’t give you a backache. Another travel-friendly provision of this machine is a full-purpose keyboard with a highly precise touchpad. It is backlit, so you need not fret about losing precious time in lowly lit surroundings. Bonus: The keyboard also offers a fingerprint reader (via Windows Hello) that ups both the security and the accessibility of the laptop. Mobile computers can especially benefit from security provisions like these since their target users tend to work in collaborative environments and be on the run for a major part of their days. Note: This laptop is compatible with Cortana, the helpful virtual assistant designed by Microsoft. You can issue voice commands to get things done when typing away is cumbersome or inconvenient. The responsiveness turns out to be excellent. Facilitating internet connectivity on this device is 802.11ac Wi-Fi (2×2 MIMO). It is a consistent and speedy wireless standard supporting dual bands—2.4GHz and 5GHz—and manages to deliver higher performance than older generations. This laptop is also fitted with a USB 3. 1 Type C port (Gen 1) to let you connect to peripherals—mice, keyboards, etc.—and support rapid data transfer up to 5Gbps. Besides the USB Type-C support, you can avail of USB 3.1 ports and an HD Webcam with Super High Dynamic Range (SHDR, 1280 x 720). An HDMI 2.0 port allows you to connect to external displays, say when you need to share content with colleagues or screen a larger-than-life presentation. 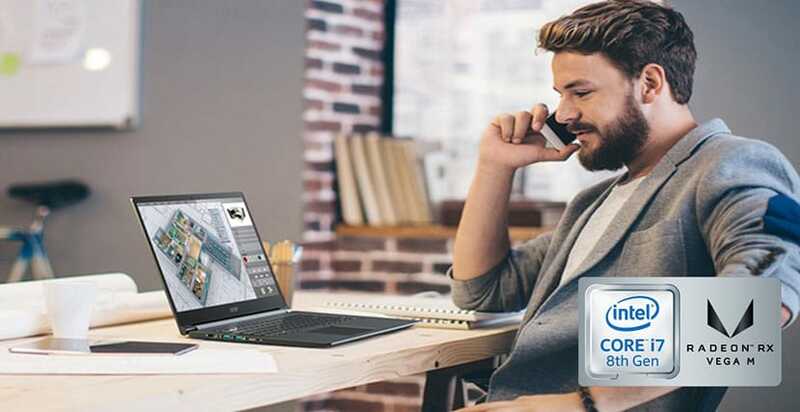 In other connectivity features, this computer offers Skype for Business, which makes any conferencing you need to do with peers or colleague easier. Fortunately, the sound system on this laptop is quite satisfactory (with True Harmony and Acer Purified Voice Technology), so the voice clarity is adequate too. Acer has been in the business for a long time—since 1976, no less. In all these years, the company has proved its mettle for producing dependable yet trendy computers that offer their users the best of both worlds—the territories of reliability as well as contemporariness. The Acer Aspire 7 A715-73G-75BW achieves a charming blend of fine performance coupled with a superior display and amazing portability. Additionally, it is equipped with several features that boost your flexibility of use, such as a backlit keyboard, internet- and device-support, and a stylish build that fits in anywhere. We will say this: the new Acer Aspire 7 seems to be a smart, 15-inch-sized investment in modern computing.